Who wouldn’t want totally amazing, smooth renewed skin? 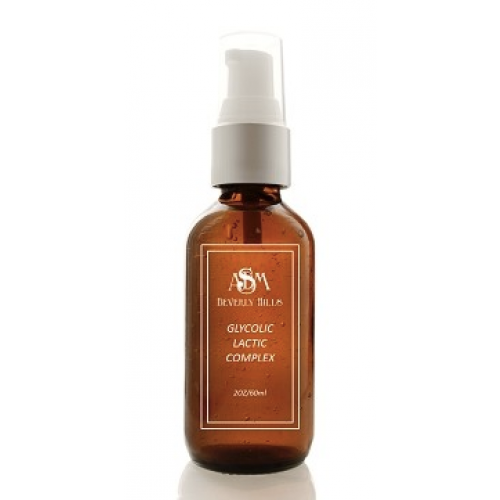 Our Glycolic Lactic Complex is a powerful, aloe-based peel that helps to gently exfoliate dull & damaged skin. This incredible complex polishes off dead skin revealing an improved appearance in both look & texture whilst making your complexion brighter and smoother. Combining Lactic acid and Glycolic acid this gel gently exfoliates and revitalizes to target imperfections and discoloration for a more brightened, even-toned finish and a dewy soft feel. 1. Lactic acid penetrates the skin and helps to kill germs & bacteria. It also helps to reduce the bonds that hold dead skin cells to the skin. Glycolic acid works similarly in release dead skin cells, but since the molecular size for the glycolic acid is smaller, it is able to penetrate slightly deeper in the epidermis (reaches the dermis). The great thing about a combination peel is that you are able to target both the epidermis and the dermis. The lactic acid will work on the top layer and the glycolic acid in the deeper layers. 2. Since lactic acid is gentler on the skin than glycolic acid, after a combo gel treatment, you will not feel your skin as irritated as if you were to only use glycolic acid alone. In fact your skin should feel moisturized and fresh. 3. Lactic acid is a moisturizing skin brightener with little to no downtime. A lactic-glycolic acid combo peel will give you the deep exfoliating benefits of a glycolic peel with the moisturizing, firming, brightening benefits of a lactic peel. You can use this combo peel as needed. We recommend 1-3 times a week. I absolutely adore this product! It’s a gentle alternative to glycolic peels that you can totally feel the difference with after the first treatment. The more you use it, the more amazing your skin becomes. For more info on our Glycolic Lactic Peel click here, or to check out our full range of at-home peels click here. Who are Shea Terra Organics?